We were very late in planning our Easter dinner this year. 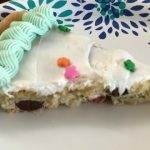 I didn’t even decide to make a Sugar Cookie Cake until Good Friday! For the last 20+ years we have gone to my parent’s house and had family dinner after church. Well, that all changed last year, mom is in a small apartment now and I had forgotten we didn’t do Easter dinner last year. On Palm Sunday, while I was busy with 5 other things at the church’s Spring Picnic and Egg Hunt, my mother-in-law suggested doing Easter dinner at her house. I told her I couldn’t think about it right then and went to work at the prize tent. Monday I spent the day recuperating from our amazing Sunday. When I called my mom I asked her if we were doing anything for Easter dinner and she said “No, we didn’t do anything last year and my deacon and his wife are taking the widows out to eat.” It was Wednesday before I checked in with my mother-in-law and she said she would do ham and potatoes and I could do a veggie and a dessert. I pawned the veggie off on Jordan and I decided to make an easy dessert. I had to make the dessert on Saturday because our church which usually has 2 services every Sunday was having 3 on Easter so there would be seats for everyone to celebrate the Resurrection of Christ. I was serving in Kids Church for the first two services and attending the sanctuary service for the third service. I knew we would have pizza for lunch and take a long, well deserved nap before heading to the in-laws for 5pm. I decided on a simple Spring Sugar Cookie Cake. Look no further for a sweet spring treat. This easy Sugar Cookie Cake is perfect for any spring gathering or celebration. Lightly spray the bottom of a deep dish pizza pan with non-stick spray. In a mixing bowl break up the sugar cookie dough roll into several pieces. Add in the M&Ms and 1 TBS sprinkles and mix together with your hands. Making sure the candy and sprinkles are well distributed. Place the dough in the center of the pizza pan and flatten it towards the outside, leaving about 3/4 of an inch of space between the dough and the sides of the pan. Bake for about 15 minutes, until the edges are starting to brown and the center is mostly set. Remove from oven and cool in pan for about 10 minutes. Then remove from pan and cool on rack for another 20 minutes or until completely cooled. When cooled, place cookie cake on serving tray and decorate. I chose to cover the cookie cake in white frosting and then sprinkle the 1 tsp of sprinkles on the top. Mix the remaining frosting with 2 drops of green food coloring. Choose your favorite piping tip and decorate the edge of the cookie cake. 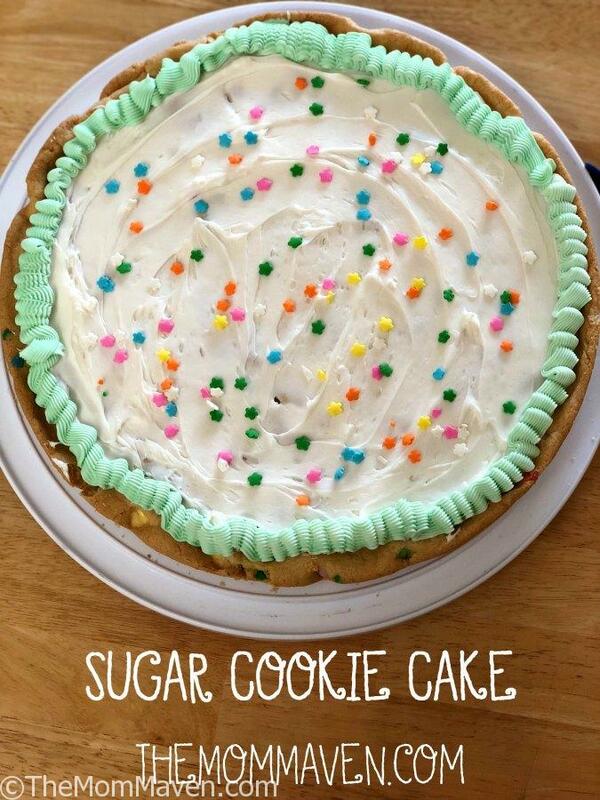 I actually made 2 versions of this Sugar Cookie Cake this weekend. The first one came to church with me Easter morning for the Kids Church volunteers to snack on between services and the second one went to my mother-in-law’s house for our Easter Dinner dessert. I hope you enjoy this recipe and all of the easy recipes I share here on The Mom Maven. I hope you share them on your social networks. I just ask that you not copy and share the entire recipe with photos. Please use the sharing buttons below and share the link to this post. Thanks!